There are two travel contests going on right now with some nice prizes. One is a three night stay in a private room for you and three friends in New York City. The other is a chance on a Canon EOS Rebel camera, an i-Pod Touch or $250 worth of other promotional prizes. Hostel.com is sponsoring a "Win 3 nights in New York" contest at this Web site. 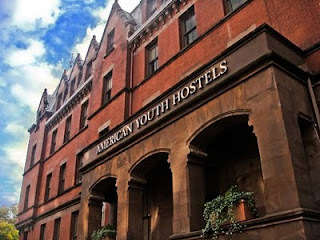 Grand prize is a private room for four at North America's largest hostel - Hostelling International New York. Located on the upper west side of Manhattan, it's conveniently located to Central Park and Columbia University. In a beautiful historic Victorian Gothic building, it offers a great alternative to the $200/night rooms typically found in New York City. I stayed there three nights last fall and really enjoyed the experience. By now, their remodeling program should be complete, as they were starting to redo all the bathrooms while we were there. Be sure to ask at the desk for restaurant recommendations…there are some awesome bargain restaurants very nearby. Bonjour Quebec is also running a contest for photographers and videographers. Submit your favorite shots of Quebec to win one of their prizes - a Canon Rebel camera, a 32GB i-Pod Touch, etc. You need to be quick however, the contest closes tomorrow night, March 31. By sharing your photos or your videos on their Web site , you are automatically entered in the "Zoom on Quebec" contest and will be eligible for one of three prizes. For more info: To stay at the Hostelling International hostel in NYC, you do not necessarily need to be a member of HI-USA although the memberships are very inexpensive. Also, all ages are welcome and everyone from teens to octogenarians do make use of the facilities. From Cleveland, it's an eight hour drive, almost 475 miles. If you drive, ask at the desk for suggested inexpensive parking options.